• View topic - Which bike should I get? I am going to buy myself a city bike so as not to ruin my racing bike. I'd love to bike as much of the year as possible. #1. 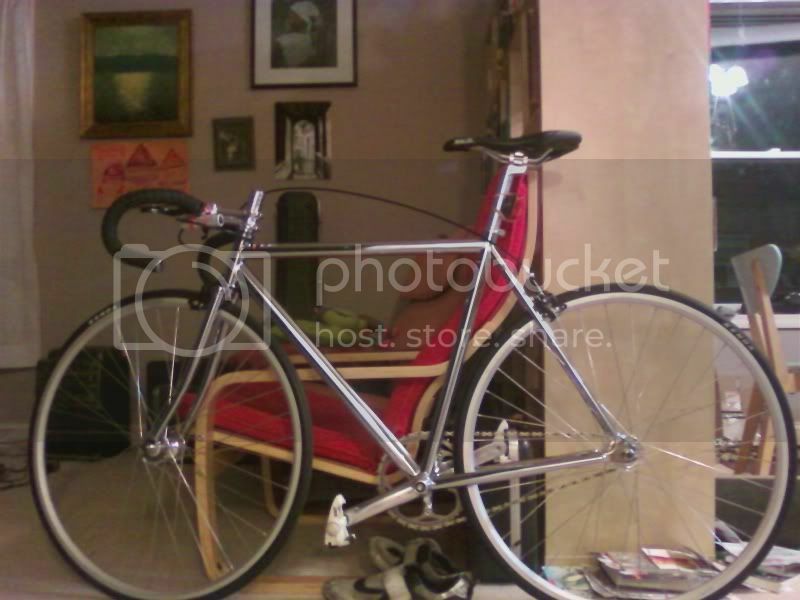 This is a fixed gear, all steel frame bike that I think I will love. It is great for what I want the bike for: daily commutes mostly in the spring/summer/fall and for rides with family and around town. Cons: It might not be "aero" enough to take on group rides, but that might be best for my racing bike anyhow. It also will be totally useless in Winter. #2. This bike is a bite more racing and in a closer position to my racing bike, which means I could use this bike for a bit more training and not just looking cool. Cons: However, it doesn't seem as commuter friendly. It also will be useless in winter. It is aluminum with carbon fork. #3. This is the all-weather bike. This bike might be fun for me to enter a cross race just for shits and giggles. Cons: This bike seems too darn slow. I'd have to upgrade tires for daily wear, and I'd have to buy some winter gear if I actually fess up to the fact that I don't have the guts to commute through michigan winters. I do in theory, but not in practice (so far). However, I love the idea. Thoughts? Suggestions? I want to get the bike TODAY before stock runs too low on my sizes. Re: Which bike should I get? The first 2 look like rather skinny tyres, and not much space for mudguards. I'm not sure what sort of weather you will be expecting, but for commuting all year round I would want mudguards and the option of wider tyres. The 3rd bike looks pretty good, you could fit some fairly thin tyres for summer, it should be fast enough. Though if running it as fixed, you might want to change it to a bit higher gear. I'm going against all advice and going with #1. I figured I'm too wimpy to actually ride in the winter. I already have a thick tire bike that I loathe. I also do not like dirt or getting dirty or trails. I'm a road guy. So the whole cross thing is just me succumbing to peer pressure from my biker friends. But I would love a steel framed bike to work on, and commute and beat up 3-seasons a year. I've already got a pair of skinny jeans on hold. I'm excited! Pics will follow soon. i will certainly have brakes. But now I need new pedals. I'm finally making more money, but not that much more. Built it tonight. rode it at midnight. I am beat. Things left to do: Cut the neck to size. Cut the cables to size. Should I: Add a set of hooded brakes? Change handlebars to carbon bullhorns? Change pedals to platform pedals with cage so i don't kill myself with clipless on fixed gear? Keep in mind, I'm a newbie on fixed gear. Will I die on my commute using clipless (Look style)? I'd say clipless pedals on fixed is a very good idea. You want your feet to be securely attached to the pedals when spinning at 150rpm+. I'm not sure about Look, I use SPDs on mine. So long as you can unclip quickly/easily at junctions to put a foot down etc. Handlebars - whatever you think is comfortable. In that photo the drops look rather low down, can you actually reach the drops, and see where you are going? If using drops, I think normal brake levers/hoods are a good idea. It means you can use the brakes when in the drops, plus gives you more hand positions. Hands forward on the hoods is pretty similar to a bullhorn position. If you want bullhorns you could just flip and chop the drop bars. It seems rather pointless putting carbon bars on a fairly cheap bike. [quote="vCLaW"]I'd say clipless pedals on fixed is a very good idea. You want your feet to be securely attached to the pedals when spinning at 150rpm+. I'm not sure about Look, I use SPDs on mine. So long as you can unclip quickly/easily at junctions to put a foot down etc. I think that my concern with Look is that when I detach, my detached shoes become ice skates. The only traction is from the tiny piece of rubber at the heel, since the whole top 1/3rd of the shoe is a teflon covered cleat. However, when I'm pedaling, it is awesome, and I think I can control my speed better than with platforms. Will I get used to it just like with regular rolling bikes? It's the fixed gear part that scares me on the stops. [quote="vCLaW"]Handlebars - whatever you think is comfortable. In that photo the drops look rather low down, can you actually reach the drops, and see where you are going? My body feels most comfortable very very low. I tried different positions, but the lowest was the best for me. It's a small bike (which I also prefer), so the reach is comfortable. I tend to ride my tri bike most, and I just train in straight lines and look up only when I'm on the bullhorns for a few seconds at a time (even my commute is a straight line), so I just took my arms/legs/back/arms into consideration on how low to drop the bars. And boy, is it comfy. However, I never took into consideration looking around a lot while on my bars. Since I'm holding the two tiny brakes in the middle, I'm barely looking up. I think, but am not sure, that this would change once I got more comfy riding fixed gear (slowing down and stopping especially), and/or if i got bullhorns and/or hooded brakes where my hands feel most comfy. Will I get used to the fixed control? If so, then I rather wait and ride safely and learn and then commute on my bike only once I'm 100% in control of the fixie instead of trying to make this more like my road bike. If not... then I should start modifying. Ideas? [quote="vCLaW"]If using drops, I think normal brake levers/hoods are a good idea. It means you can use the brakes when in the drops, plus gives you more hand positions. Hands forward on the hoods is pretty similar to a bullhorn position. The chopped up bullhorns would be too short. I also check out the bullhorns the guy is selling, and they are aluminum, just black aluminum. I think that in theory, going with those bullhorns (if they fit, since they are oversized tubing), would be most comfortable for me. However, I'm running out of $$$, and even though those bullhorns are cheap, they aren't free. Will I just get used to the drops? Or should I go with what I already know feels comfy and spend the last of my cash? So many darn questions. Moar halp plz? I can't imagine being comfy on fixed without racing type brake hoods for my hands, they just seem to settle better into that 'pushing a wheel barrow' position. I rarely use the drops proper unless I'm fighting a headwind. I found I can ride fine without being clipped/strapped to the pedal on my commute fixed hack bike, I've just got gold old-fashioned union rubber flats on my hack fixie which allow me to just jump on and ride in normal shoes. Anything over 15 miles and I use the other fixed with spd shoes. Last edited by Gastroplodder on Fri May 06, 2011 2:41 pm, edited 1 time in total. as for riding fixed it will get a bit to get use to and you will forget here and there and get "bucked" when your feet keep going. i find this to be true when its early and Im commuting to work after being on the road bike all weekend. I have bullhorns setup on my commuter and really like that setup but its all personal preference. I would recommend riding what you have now, put some miles on it then if you dont like the setup go from there, rather than speculating what you may or may not like and buying preemptively. [quote="audi666"]I would recommend riding what you have now, put some miles on it then if you dont like the setup go from there, rather than speculating what you may or may not like and buying preemptively. ...this seems wise, but just a bit scary since I'm just a little scared of my fixie since I can't skid yet. I've been riding, and racing, on fixed since about 1987, and I'm not very good at skidding. It just wears your tyres out, and I think its generally a hipster thing ! If you ride fixed well, you won't need to skid ! I've been riding my bike, and I love it. LOVE it.